My sofa was a wedding gift. Other than that, there is not a single furnishing in my home that was not bought secondhand! True designers always incorporate items with age and from different sources. Even the Pottery Barn catalog displays pressed ferns and tobacco baskets among its new furniture! Pickers--people just like you and me--buy great-looking stuff at yard sales, auctions, and thrift stores. Pickers sell directly to a few dealers and designers--or, bring their wares to wholesale antique markets like Scott's in Atlanta. Antique dealers and designers all over the Southeast drive there to fill their shops back home. At that point, a lovely piece of furniture has been marked up as many as four times from its humble secondhand origin. The fabric is usually expensive if someone has spent the money to have draperies custom-made, with trim, double linings, and weighted hems. Unlike ready made curtains, these are often the only way to find true floor-length panels. 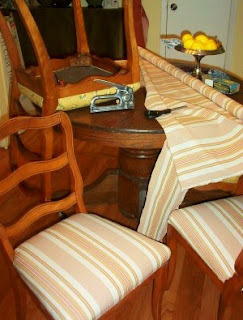 Use the voluminous yardage to cover tables, make pillows, or reuse hardware and trim for another project. The ubiquitous French Provincial and Modern furniture is usually made with real wood and dovetailed drawers. French Provincial has good grooves and molding for do-it-yourself glazers. You can find sturdy bookcases for less than the cost of Sauder specials, and you don't have to put them together yourself. Paint them whatever color you wish, with contrasting interiors for interest. Link several bookcases together with molding across the top. My favorite copper kitchen lamp cost $1.50. Unusual or antique lamps are elements which can lift a room from the ordinary Kirkland's variety. Look for the handmade touch and textures here--needlepoint, old tapestry, bark cloth. Some chairs have seats which unscrew for recovering. An old remnant and a cup of paint can transform a plain chair in half an hour. Benches and pairs of chairs are extremely versatile. The other two sofas we got from friends who were moving back to another country and were wanting to get rid of their things - never be afraid to ask people who are moving for their things! I used to be, but I've now been given so many beautiful things by asking that I've learned the value! They had bought them new recently and when we visited I fell in love! They decided they were just going to give them to the first people who asked, and we did! Thank you, thank you, thank you for such a wonderful series of articles here!!! We are moving in August from our 1000 sq foot home (including basement there) to a 2000 sq foot home, and I know I will be coming back to your blog for inspiration and ideas because I will be furnishing and decorating on a REALLY limited budget, and there is quite a lot that I need, furniture-wise... I keep reminding myself to take it slow, that we can just enjoy having empty space for a while, since we're really cramped in our current space. also available for our members. We know many products and services over web are quite difficult to find and it's next to impossible to find it over web.If you are looking for any product or services and not able to find it,in that case you are at right place mail us what you are looking for and our researchers send you all the details on your mail account.